Wipeout! is one of WarioWatch's microgames in WarioWare: Twisted! 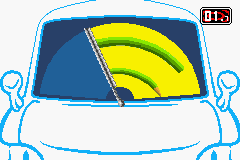 The purpose of the game is to tilt the Game Boy Advance to move the wipers until the car's windshield is clean. There is a chance that the spot on the windshield is the cat from Cat Nap from WarioWare, Inc.: Mega Microgame$!, which also appears in Pet Cat. 1st level difficulty: The spot on the windshield is small. 2nd level difficulty: The spot on the windshield is wide. 3rd level difficulty: The spot on the windshield covers almost the entire windshield. When a very small amount of filth is left in a corner of the windshield, a red arrow appears in that corner. This page was last edited on November 17, 2018, at 03:34.